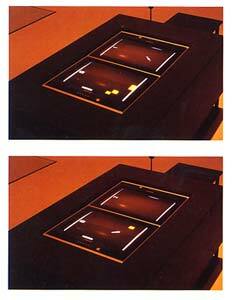 - To play alone or with a contestant, please press upper black button located on the right-hand side of the control bar. In the case of single player, he/she is pitted against the pre-set computerized program. - Scoreboard will automatically record points performed and declare the winner with 9 points in each contest. - To re-start the game, please re-set by pressing the lower black button. Then, go to upper black button as usual. - When the game is no longer played, the computer system will automatically revert within a minute to its pre-set program of automatic playing.